Three blanks in a row and it's time to do something different. So, having a couple of new rods I was itching to try out (Chimera Avon Specialists if you must know) I dragged out a couple of pike rods that I hadn't used for three years, threw two packs of deadbaits in a carrier bag and headed for a water I hadn't fished for ten or twelve years. Quite why I headed there I'm not sure. It must have been the thought of trying out the rods and the feeder rigs I intend using for roach at some point soon. I wanted to see how they coped with various size feeders. There was also the chance of a jack if I threw a deadbait out. I'd either fish two deads and a feeder or vice versa, depending how I felt. Whatever was most likely to prevent another fishless session! I knew where I wanted to fish but there was howling gale blowing straight into the swim. I looked around the sheltered bank but didn't fancy it at all and, with the rain easing off as dawn broke, I set up in my initial choice of swim. Around ten o'clock my first fish of the year was landed. A small roach to the maggot feeder. I almost put it out as bait, but it had broken my duck. So I released it. There were bound to be more along in a minute. Shortly after, as I wound in the feeder for a recast something grabbed hold and I briefly did battle with a jack - until it bit me off. I think a tiny perch must have hooked itself without registering a bite because I wound one in later in the day. At least there was one pike in my swim. And half an hour later I think I landed it on a pollan that had dropped short of where I intended to cast it owing to the strength of the wind. When I recast a fresh bait, however, the wind had dropped enough to get the extra distance. This session was a last minute job and my planning was rather hit and miss. 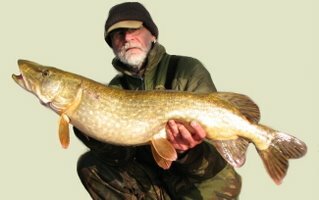 My real interest was the roach fishing trial and I had just popped three spare pike traces in my 'stillwater' tackle box, six deadbaits in the carrier bag and the two pike rods that hadn't been retackled for three years in my quiver! I'd managed to find one drop-back indicator but had to cobble a 'dangler' bobbin to the back rest to make a second. I had also planned to pack up in mid-afternoon as I wasn't taking the session too seriously. Just before two, while setting the bobbin on the feeder rod. I saw the line peeling off the reel on the pollan rod. With my sounder box under the brolly I had set up to keep the chill north-westerly off me the wind was carrying the sound away from me as the line ran through the Delkim. I grabbed the landing net, closed the bale arm and after a couple of turns of the reel handle everything locked up. This was no four pounder. It actually pulled back and had me backwinding! After a brief tussle it was wallowing ready for the net and in it went. Hmmm! Lying in the net it looked real pig. On the scales it tipped past 16lb. The photo doesn't do it's belly justice. You might think it would have been foolish to pack up after that. But it would actually have been a wise move, for apart from a tiny perch and a small roach on the feeder that was my lot. Not to worry. I'd tried the new rods out, well one of them. The head wind didn't really let me see how far the rod would cast a feeder, but it handled a 40g blackcap well enough. The roach rig worked to a degree. A tweak is required. And I hadn't blanked. In fact I'd beaten my previous biggest pike from the water by over five pounds. Seeing as the rain had held off too it had been a good day all round.